The key to the efficient use of your available office space in Anaheim, Irvine, Los Angeles & San Diego. When was the last time you had a good look around the modular office that you are occupying, maybe right now as you read this? The irony of the situation is more than likely that you are not the boss, but have nicer furniture around you than the bosses of many companies had in years gone by. Modular Office Furniture or Cubicles have come so far! You have the privacy and quiet that you need, with lots of storage space and shelving. No more drab colors, but instead, a beautiful mahogany (well, melamine anyway) desk, bookcase, and credenza – all richly appointed, warm, and elegant. Your work area is truly a versatile and functional surrounding, but at the same time stylish and welcoming. You don’t dread coming into the office. How could you with modular office furniture appointed with designer handles, ball-bearing drawer slides and so much room for your projects that you can arrange everything just how you want it without feeling like the space cramps your style and creativity. comfortable ergonomic chairs, efficient filing systems, printer stands and computer stations, call centers, workstations and cubicles; all of these modular office furniture pieces and arrangements have changed the office landscape into a modern wonder of efficiency and peace. It may not come as a complete surprise but the work we do in our office week, in and week out, is far more productive if the work takes place in a well designed office. A well designed office layout signals the values and objectives of your business and the use of design principles in office interiors communicates a company’s values and identity (including its color scheme). So why is it that so many companies are still stuck with boring, unattractive and ultimately unproductive office designs? In most cases, as always, it comes down to two factors, office design costs both money and time. But those are short sighted costs. Companies of today need to meet the business needs of today, most companies have a remote or mobile workforce, have diverse employee demographics, specific corporate and branding objectives and have an international workforce and global clients. Office design has to reflect this. Companies need to rethink the very fundamentals of office design. Gone is the 1960’s legacy of workplaces dominated by boring cubicles and closed door private offices. Office design founded on employee privacy and individuality is no longer welcome. Today’s office design is led by the realization that collaboration is an increasingly critical ingredient to the success of basically any business. But giving up the individual space, which cubicles and private offices give employees, on behalf of cooperation and collaboration of course doesn’t fit all companies. As in most contexts the “one-size-fits-all” approach hardly ever works out. Eg. web programmers spitting out code need more privacy than salespeople using the telephone. When it comes to office design, function often follows form. When an office is configured to maximize employee interaction then collaboration becomes an integral part of every workday. Office designs based on setting up work areas wherever they are needed in the building can raise satisfaction while boosting density. Multi-purpose spaces, central placed common areas are examples of strategic office designs. Today there are many exciting office design techniques and products that can help you get more from your workspace. Long gone are the cubical nightmares in grey surroundings. 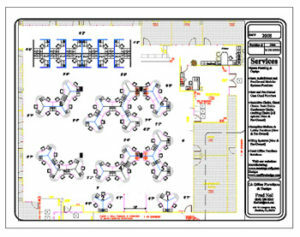 Have another look around where you are sitting – perhaps it is time for a new office layout or design? Even just adding colors or changing the chairs for new Ergonomically Designed / Colored “Space Chair” options will make a big difference. An office redesign can insert energy and life into a company and its employees. A healthy workplace is vital for employee performance and productivity, which in turn leads to growth and profit. Companies have to invest in the right kind of environment to boost employee satisfaction, well-being, and productivity. This can be achieved by using intelligent Space Planning & Design principles. Studies show that when people are happy at work, they tend to perform better, persist longer and choose higher goals. Thus, a well-thought out office design is the route to a healthier and more productive work environment directly impacting company performance and ultimate success. Companies are choosing strategic office design reflecting cooperation and collaboration in office cubicles for the modern office. 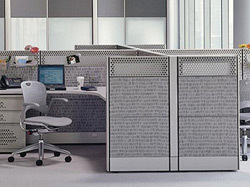 Cubicles are revolutionary inventions merging privacy with integration. Cubicles keep employees engaged and connected with the rest of the workforce during the workday without sacrificing privacy. They create a good private and communal balance. Everybody needs his or her personal space, but also, socializing boosts mood and improves employee morale. Both privacy and feeling of community are central to productivity and creativity. Best ideas are nurtured when there’s a feeling of community and solidarity, where employees can easily interact with each other. The need for a workplace that promotes team spirit is crucial. Employees who feel social support in their workplace are far less likely to face serious depression problems, according to a recent study published in the American Journal of Public Health. People who said they felt their colleagues’ support in a time of crisis were spared the rigors of job stress. In the study, men and women who felt little social support at work were two to three times more likely to suffer depression problems. 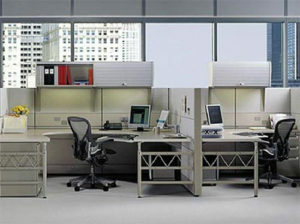 Manufacturers are constantly searching for innovative office cubicle designs to help companies boost their performance. They provide companies with examples of a new class of products that use the latest technology to foster performance. The concern for privacy and noise at the workplace led companies to use technology to provide office privacy. Loud talking, music or radio in the next cubicle might affect others’ ability to concentrate and perform their own jobs. Conversations that can be heard three cubicles away might be annoying. The open plan office with small cubicles in large, wide-open rooms can be a nightmare. The end result is stress, anxiety and poor productivity. The ADA and the guidelines that it cites (see our previous article “A Brief Guide to ADA Regulations and Implications for Business in determining their Spacing Planning and Design requirements in Irvine, LA & San Diego”) are intended to give guidance for designing public spaces where people with disabilities must be afforded ready access. As such these guidelines are not requirements when applied to private work settings, like office environments. The guidelines highlight functional needs of individuals with specific disabilities. In the contract furniture industry where CA Office Design operates, there is no certification process to determine what products are accessible or acceptable. If terms like ” ADA compliant”, or ” meets ADA requirements” are used to describe a product, it is typically the opinion of the manufacturer. It is always wise to understand the local building codes that apply to private buildings and office space in your city or state. Space planning and design in accordance with the requirements in Anaheim, Costa Mesa or Irvine are very different from those in Los Angeles, Corona, Riverside or even in San Diego. In the spirit of accommodating the varying needs and abilities of individuals, CA Office Design and its suppliers often refer to the ADA accessibility guidelines and recognized experts of accessible design when designing and developing new products as well new office spaces. We encourage open plan designs, with the possibility of as much collaboration as possible whilst still creating privacy where necessary. By using color and light with collaborative design principles, employee conditions can be enhanced significantly and productivity improved as a result of that. In conclusion, Space Planning & Design not only forms a very important part of an Employer’s ADA Responsibility, but should also be an integral part of its Employment Strategy. To see how we can help you improve your office environment, contact CA Office Design for a free consultation. PreviousPrevious post:Office Design 101NextNext post:Office Design Trends – Your Key to Collaborative Office Space!